Just a short entry tonight – I had a monster show this weekend so I’m going to be making lots of dust between now and Thanksgiving to restock. I plan to take lots of pictures and post short blog entries while I take breaks in working. I want to circle back a step to address one piece of business on clamps from the last entry. It’s not a job breaker – but when I clamp my projects I make sure that all of my bottom clamps are the same size and height. This avoids having have several issues. The photo below, while quite exaggerated to show the point, will highlight two issues. The first issue is that center clamp has a large gap between its top surface and the bottom of the work piece. Obviously you now have an unsupported section of your board. Your board needs support along the entire length. Now, while I’ve never done this – did you hear me clear my throat – if you have a habit of pushing the boards downward while using your other hand to turn the crank – then having a clamp that is not the same height as the others while in all likelihood end up giving you a bowed board. I found pushing down on the board helps to avoid the individual boards slipping upward with the clamp pressure and the slick nature of the glue. Using a caul system would also deal with slippage. 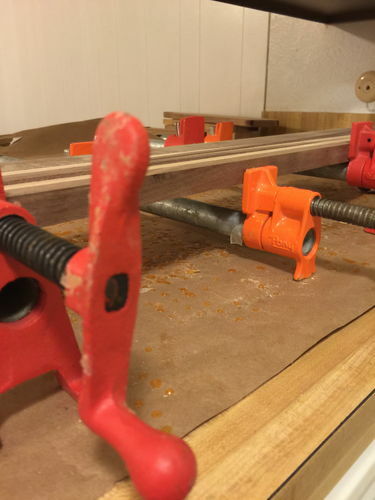 The second issue is that the clamp head needs to have more “bite” on the side of the board so that it actually acts as a clamp and not as an impediment to a good glue joint. If you tighten up that center clamp with it sitting like it is all you’ll manage to do is make the board want to come up and squeeze out of the clamp like a bar of soap spurts out of your wet hands. I’m not going to even try to fake knowing how to explain clamping torque or how even pressure really works – but let it suffice to say – try to use all the same height clamps on your board and make sure you have plenty of bite on the board with your clamp head. I have seen some woodworkers use platforms to lay out their boards and if you use that system the height of your bottom clamps become a none issue. Okay – I said short. Back to the shop for me. I’ll post more later in the week. I hope this helps someone out there. Good tips. I have pressed the boards down before as you described to keep them all even/flat on top and I HAVE had them blow up due to incorrect clamping techniques. LOL. That’s when I use those four letter wood shop words. Great blog and I have learned some great tips/ideas. Look forward to the next installment. Good tip. My pipe clamps are all the same size so I’m already covered. The only time I even come close to this issue is if I mix pipe clamps with a couple Jorgys and then this comes into consideration.